Please visit www.DIY3DTech.com for more information on this and many other projects! 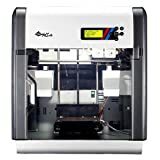 As in this episode we will be taking a deep dive into the setting of Slic3r to configure it to slide load gcode via the XYZ Ware application to the XYZ Ware Da Vinci 2.0 3D printer via importing a Dot 3w file. For this you will need several support applications and we have set up a web site with all the links and screen shots of the config screens and header/footer codes. ← K40 eBay Chinese CO2 Laser Cutter & Engraver – Corel Laser Speed Issue Fixed!